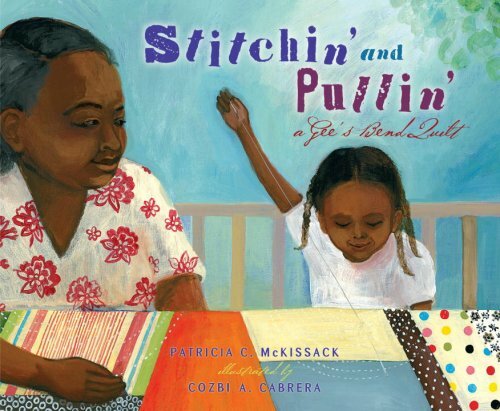 Stitchin’ and Pullin’: A Gee’s Bend Quilt, by Patricia McKissack, tells the story of a young girl growing up in a community of quilters. As a small child, she watches the quilting, and then under the tutelage of the women, she begins her own quilt. These women are making more than lovely quilts. With each stitch, they are keeping tradition and history alive. For generations, the quilts have combined the practical traits of reusing old fabric to make warm blankets with the creative endeavors of employing cloth and color to make art. Dotted triangles and a few plaids mixed in. Poetry Friday round-up is hosted at The Holly and the Ivy. The schedule of upcoming hosts is available at KidLitosphere Central. Oh  don’t forget to find or write your post by February 23rd for the preferably-multimedia Carnival of Children’s Literature, with the easily workable theme We Love Kid Lit! I’m thinking of doing some audio stuff with the kids. It’s exciting. Mother Reader, you always manage to find cool books I haven't seen before. Thanks for the poem, too! I'll have to look for this one. Tonight, my aunt finished the vibrant queen-sized quilt made with pinwheel patterns and other triangles before she left town. Almost six years ago, she made a quilt for my daughter. When she made a quilt for my daughter's dolly, I said, "It's my turn, please!" The quilt is busy and colorful. I just love it. Thanks for this review. I hadn't heard about this book until reading your post. I have just purchased this book. Will read it in my weekends.